Our solid wood Shaker Jewelry Chest is handcrafted in the USA from solid oak or cherry wood. 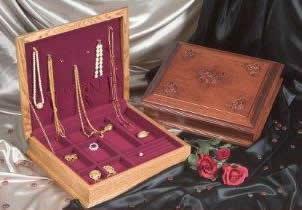 This Amish handcrafted Shaker Jewelry Box includes brass hardware, necklace hooks, and a pouch. Your choice of hunter green or burgundy felt lining is available with this Jewelry Box as well as with or without rose design on lid. All of our Amish furniture is made in the USA of 100% solid hard wood! This Shaker Jewelry Box is the perfect keepsake item for the someone special in your life! Consider a Jewelry Box, Jewelry Armoire or Jewelry Chest as a gift! We have all of your jewelry storage needs!